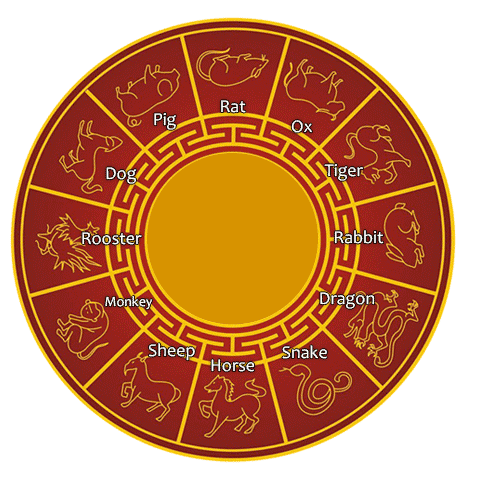 Like the western 12 astrology signs, the Chinese 12 zodiac animal signs also provide guidance on people’s love match and personality analysis, while the difference lies in the time division: western astrology signs are marked by 12 months according to Gregorian calendar, while Chinese animal signs are defined by a 12-year circle. Now, use the calculator: select your Gregorian date of birth, and you'll reveal your date of birth according to lunar calendar, together with your Chinese zodiac animal sign. Chinese animal sign (Shengxiao) follows the 12-year cycle defined by lunar calendar. Each year in the cycle is represented by one animal, and people’s sign is determined by their birth year. The cycle repeats every 12 years with the order like this: Rat, Ox, Tiger, Rabbit, Dragon, Snake, Horse, Sheep, Monkey, Rooster, Dog and Pig. For example, 2018 is a Year of the Dog and 2019 is a Year of the Pig. Click the animal signs on the following wheel to learn more about their basic facts including birth years, luck signs, and love matches. There is a time gap in the year dates between lunar calendar and Gregorian calendar. Therefore, some people born in January or February of Gregorian calendar may actually have the animal sign of the last year. The exact date for Lunar New Year varies from 21 January and February 20. The most common-seen method depends on Chinese New Year, which is considered as the division of two animal years. When a lunar year comes to an end, the animal will shift to next one. Chinese people’s animal signs are marked by this method. The other method is calculated on solar calendar. In China, one year can be divided into 24 solar terms, which are used to indicate the climate change and guide the schedule of farming work. The Lichun term (Start of Spring) comes first, which falls on February 4 or 5. Passing that day, a new animal year starts. Nowadays, the zodiac defined by lunar New Year’s Day is rooted in Chinese astrology culture, which is widely used in lucky date selection and love compatibility tests. If you have got your sign through the calculator, discover more about your Love Compatibility. How to calculate your animal sign mathematically? Divide your year of birth by 12 and read about the remainder. If the number of the year can be divided with no remainder, take the remainder as zero. Each remainder corresponds to an animal sign. Take the great singer Celine Dion for example: She was born in 1968. No remainder equals to 0, which indicates Monkey sign. So she is in Monkey sign. Barack Obama was born in 1961. 5 corresponds to Ox, so Obama gets the Ox sign. Half adjust the result, get the integer 8 and the corresponding sign of Dragon. Hi, you have a good luck in the love life this year and it is possible for you to find your true love. Try to be more active and take initiative, and your best time is May and December. What business will I put up to become successful? I am female tiger. Born on December 18, 1974. Please help me ..Thank you and more power!! In this pig year , I'm pig and my boyfriend is rooster.. are we compatible ? Hi, your love compatibility may still require some efforts and you can take part in some outdoor activities together. Best wishes! This year is not very stable for you and you are likely to gain some good chances in career and it is possible for you to get a promotion. You can try to communicate with your friends when you feel confused. Good luck! how does TIGER and RAT work together? It is hard to say since sometimes they can be hot and sometimes they can be very cold. However, the compatibility is not very stable and the relationship need to be maintained more carefully.